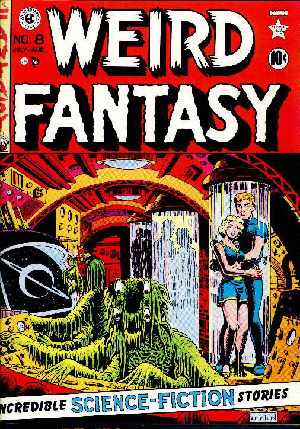 Al Feldstein was born October 24, 1925 in Brooklyn, New York. He studied Fine Art at the High School of Music & Art, Brooklyn College and the Art Students League. In 1941, while still in High School, he took a job after school and during the summers at Jerry Iger's comic book art service shop (Will Eisner had separated from Iger in 1940), running errands, erasing pages and working his way up to inking backgrounds, inking figures, and finally penciling and inking entire pages, working on Sheena, Dollman, Blue Beetle, Phantom Lady and many others. When he graduated Music and Art with a scholarship to the Art Student's League, he'd made up his mind to become an Art Teacher. So he entered Brooklyn College's School of Education, attending during the day, studying at the Art Student's League at night, and working for Jerry Iger during the summers. To avoid being drafted into the Infantry during World war II, he enlisted in the Air Corps as an Aviation Cadet, and spent the entire war as a Special Services Artist awaiting flight training. Upon discharge in 1945, he returned to the Iger shop while waiting for the start of the next semester's enrollment in Columbia University's School of Education under the G.I. Bill, and was soon making more money than a starting Art Teacher. He left Iger and began free-lancing in 1946, creating three teenage books for Victor Fox: "Junior," Sunny" and "Corliss Archer." In 1947 he joined William Gaines's "EC Comics", doing crime, romance and western stories for E.C. 's various titles, writing and illustrating his own stories. 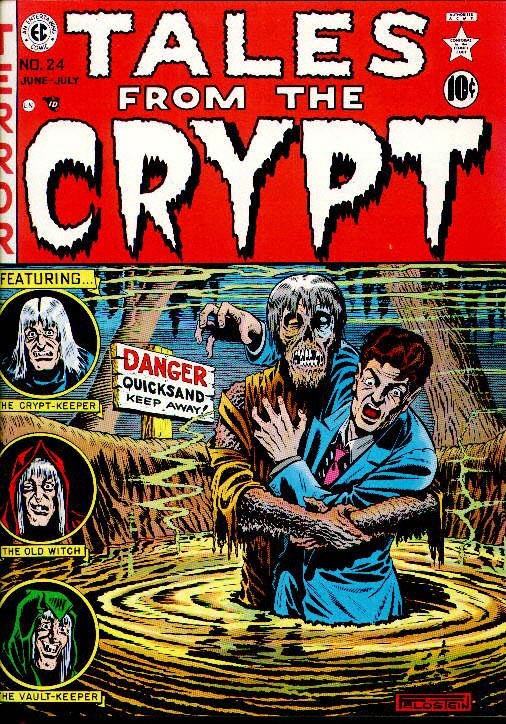 In 1950 he co-created, with Gaines, a new line of horror, science fiction, and crime titles that eventually became Tales From the Crypt, Vault of Horror, Haunt of Fear, Weird Science, Weird Fantasy, Crime Suspenstories, Shock Suspenstories and Panic. Each of these titles would help to influence many dozens of other books from a multitude of publishers. The success of the EC line is legendary, and it's influence was seen in almost every comic published for many years after. 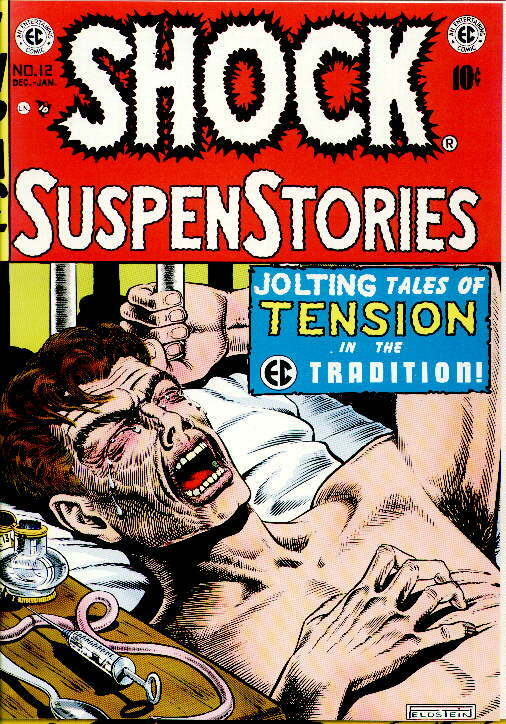 Unfortunately, the success of EC was crippled by the Senate Hearings on Juvenile Deliquency and the publication of Dr.Frederic Wertham's scathing treatise "Seduction of the Innocent" which largely blamed all social ills and juvenile delinquency on comics themselves. This placed a burden much too heavy for EC, and soon Bill Gaines ceased all of his titles with the exception of Mad magazine, which was being edited by Harvey Kurtzman. But Kurtzman was soon to leave Mad, and Feldstein would take over the Editorship of the magazine in 1955, a job he held for almost thirty years before retiring at the end 1984...taking the magazine's circulation from 325,000 quarterly to a high of almost 3 million eight times a year by gathering a staff of extremely talented artists and writers, supervising every phase of its operation, editing or re-writing every word, designing its layouts and creating the format that led to MAD's phenomal success, including adopting and christening its now-famous trademark, the gap-toothed, grinning, freckle-faced Alfred E. Neuman. Feldstein's artistic style was unique unto itself. His thick lines, blocky anatomy and two-dimensional visuals were copied by many during the heyday of the sci-fi and horror comics in the fifties and is still regarded as highly original. After he retired, he returned to his first love, Fine Art, and also began doing commisioned oil paintings recreating his famous EC comic book covers. Today he lives the life of a cowboy in Montana. Check it out! Al has his own page! It's GREAT!! This is the th page view on this website since 1994.